MAGNET BUILD SURFACE PLATE: Provide all-round protection to your 3D printer build plate and ensure consistent temperature throughout the build surface. Easy to remove the printing models after cooling. SAFE POWER SUPPLY: Ender 3 Pro comes with a Mean Well UL Certified power supply, protecting your printer from unexpected power surges, that can heat the hotbed to 110℃ in just 5 minutes. WHAT YOU GET: Creality Ender 3 Pro 3D printer, 12 months warranty, lifetime technical assistance and 24 hours professional customer service. 4. Safety protected Power supply, reach 110℃ for hotbed in about 5 minutes. Additional power cut protection function to meet the needs of fast heating and longtime printing. Ability to resume prints even after a power outage or lapse occurs. Love my Ender 3 pro. Assembly was easy, though slightly larger images could help to clarify the direction on the support beams. With a little bit of tuning, the printer can achieve very good prints with minimal work. I honestly really love this printer. It is one of the best ones I’ve found at this price. I ran into a small issue while assembling it but realized it was my fault but it is still just as easy as they advertise. The prints have come out amazing( even better than expected). I still have to tune a couple of things but it’s incredible. Love it and would buy it again!!! Printed really well right out of the box, only real trouble is the bed warps after first few uses. Added BLtouch and stock bed works great. Upgraded to MKS GEN L motherboard, filament runout sensor, Hero Me fan duct, raspberry pi 3 with octoprint. Printer now has all the features of a $1000 printer. Fantastic base or starter unit. Highly recommend. I love this printer!!! This is my first 3D printer. It was pretty easy to setup. Leveling the bed was easy, especially after watching a YouTube video. I am completely amazed at how awesome this is!!!! This printer is fantastic. I have had virtually no issues with setting it up or bed leveling, or tweaking for prints. Once you have slicer settings tuned it it works spectacularly. Just got it going and did the test puppy. The sky is the limit and I am already getting requests for prints. The build was quick but I took my time. A combination square or machinists square is of great help...along with the internet. Thank you a great DIY assembly!! Unable to level bed due to slight warp;however, can be fix with glass. Other than that it works. Be sure to check fasteners a couple were lose. Easy instructions but it does help to watch a few videos on YouTube for more assistance. They helped me. UPDATE: GLASS PLATE WORKS. PRINTS ARE AWESOME Sept. 2018 UPDATE: modded this to be perfect. I purchased the Ender 3 Pro for my wife. This is our 4th 3d printer. 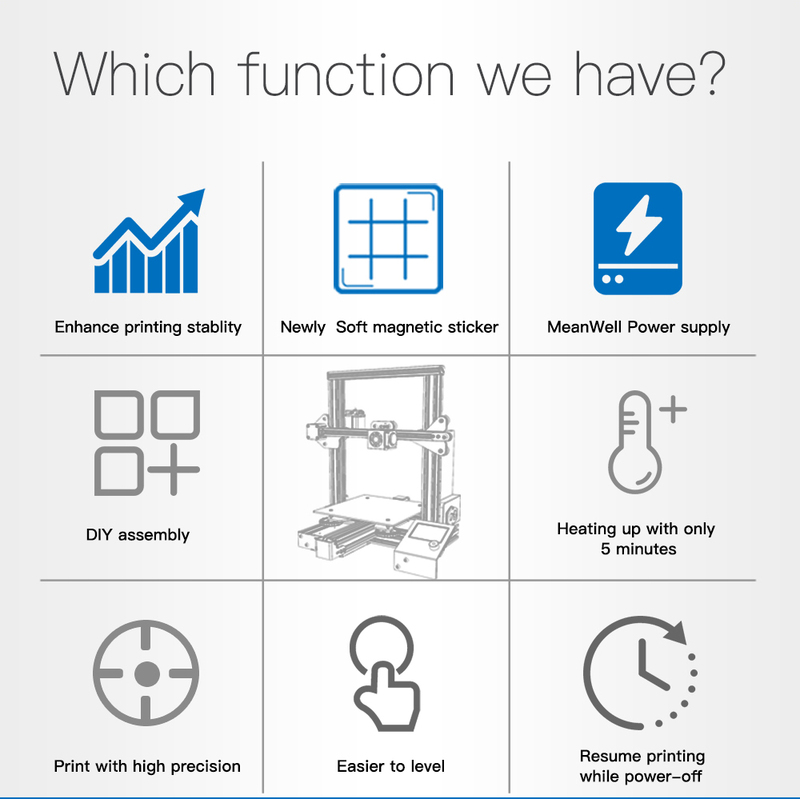 We have the Monoprice Select Mini, An Original Prusa MK2s and an Origianl Prusa MK3. The Ender 3 Pro has roughly the same build volume and the Prusas and some of the smart features that we like. Positives: The magnetic bed is AWESOME. 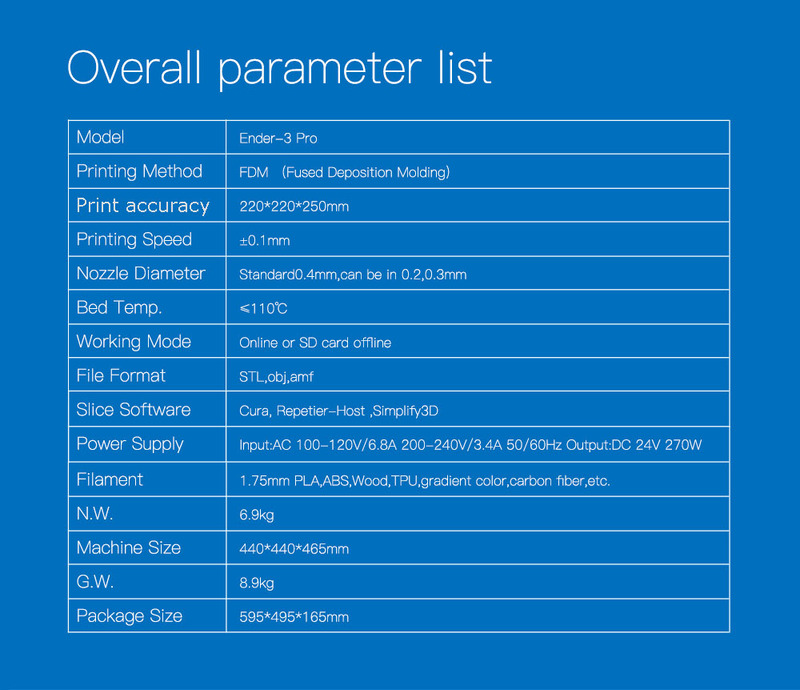 With my Prusa Mk3 we got used to having our prints pop off the build plate with ease, so when it came time to pick a new printer for the wife, the build plate options were high on the priority list. The magnetic sheet is much more flexible than the spring steel on the Prusa. Taking objects off is easier as a result. Often with the Spring Steel the small objects will still be stuck and it becomes difficult to flex the plate enough to loosen it - especially with PETG. That seems to be no problem for the Ender's magnetic sheet. It can roll up like a tube if you want. We haven't attempted PETG on the Ender yet, since I tend to use the Prusa almost exclusively for that, so I'm still not sure how the Ender's magnet will hold up to the extra heat, but Creality 3D claims it will be fine. This isn't the machine for you if you want to print ABS though. Get the Ender 3 Upgraded with the nicer glass plate for that. If PLA is your thing though, I can't say enough good things about the magnet - it's just cool. The V-Slot rollers are definitely better than linear bearings. I think Creality made the right move with the rollers vs the standard prusa rod and bearing set up. Rods are more likely to bend or be warped slightly. The v-slots are easy to tighten up and are just solid. I'm impressed and kind of wish Joseph Prusa would incorporate that design into his machines. I think that must be the reason the CR-10 5S can be so big without compromising the quality of the print. With linear bearings and rods you would likely have too much flex when moving those large heavy objects on the y-axis. Having the v-slot would allow the axis to stay stiff even with all the acceleration forces - granted, still very slow. We did have some actual power interruption to deal with. Since the Ender 3 Pro has power failure protection built in, it wasn't a big deal. We did notice what looks similar to a layer shift at the layer that had the power interuption though. It wasn't bad enough to call it a failed print, but it was noticeable. The Prusa MK3's power interuption seems to be much better, but at almost triple the cost, I would expect that. The prints coming off of this Ender 3 Pro are just as good as any Creality Machine that I have seen. There are so many people that are in love with the CR-10 series because of it's low cost and quality prints. The Ender 3 Pro prints just as well in a much more compact and mobile package. Negatives: I wish Creality would stop using the push in/out micro sd cards. I've had issues with the MonoPrice Select Mini (like almost all mini owners have) and I anticipate we will have a similar fate with this machine at some point. So we are already looking into upgrading to an octoprint setup. I made the assumption that the motherboard supported auto bed leveling and filament run-out since it does have the updated board. BUT it isn't the Version 2 board, it is just the 1.1.4. Its more stable than the other Ender 3 models and moves the fan port from the top of the electronics box to the side (MUCH BETTER PLACEMENT) but it doesn't have the fun stuff that the CR-20 and CR-X have with the version 2 board. I would imagine Creality will offer an upgraded board for this at some point though. I am disappointed that I can't have the filament run out sensor on this since most of the Creality machines are getting it now. It's such a nice feature. Of course with the build volume of the Ender 3, it probably isn't that bid of a deal. You aren't likely to use up a full roll on a single print so just keeping an eye on it is sufficient for a printer at this price point. The bed leveling isn't THAT bad. I did notice that my aluminum bed isn't 100% flat. It does seem to dip ever so slightly in the center so leveling has been a chore. It isn't off by enough to cause any print problems though. In fact, I can't believe how well the parts are printing in spite of the issue. It was a great first choice for my first printer. Simple build with a few QC issues, but easily fixed. Great way to learn how 3D printers work. I have only printed a few small things, but the printer works well. As a newbie to 3-D printing, I found this printer accessible and easy to set up just because there is a large community devoted to it on the Internet. If you engage with the community devoted to this printer you won��t be disappointed. 3-D printing can be intimidating but this printer made it easy to get started. I recommended for beginners like me, and the price is not bad at all. Understand though, that there will be frustration and moments where you will throw your hands up in the air and quit. Stick to it, it��s a fun hobby and again, this printer has a robust community online. This is my first 3D printer and I have loved printing things out on it. I had one small issue where I hadn��t know that the wires on the back of the board had come loose from the board. I reached out to their customer service and was very pleased with how they helped me troubleshoot. Ultimately I discovered and fixed the issue myself but if I have any issues in the future, I��m confident their support will be very helpful! This printer is a great deal for the price, but you need to have a good amount of patience and mechanical aptitude to work out it's quirks if you want to really get high quality prints from it. Setup took about 30-45 minutes and was not very difficult, I was printing within an hour or so. Once you learn to level the bed and load the files onto the SD card your basically all set. Sturdy build and have had no issues so far in the few weeks I have had it. This item was very exciting to receive and had worked really well for the first couple of weeks. As of now the extruder is no longer working properly and I'm under to make any prints... EDIT: Great support! New extruder motor on the way. Very good printer, my only complaint is that there are some loose parts that have to be adjusted, but it's not a big deal. Printer works perfectly fine. Any issues I had were on the user end. Like not using rafts or supports for certain models. Also, your slicer software DOES matter. I had a lot of failed prints on Cura, which would turn out fine later on Simplify3d. My other printer is an Anycubic Kossel delta and I have a preference for the ender 3 over the kossel due to the larger print bed. The printer arrived fast and is amazing for the price. I own a few printers already and would easily buy more of these. My only problem was the printer will not home in on the X axis. When I emailed the seller about this we went a little back and forth and ultimately they asked me for a video of the problem, but it was just too much trouble by that point so I ordered a replacement part for under $3 online and got it working just fine. I had to manually push in the printhead to the far left before each print until it came in, but it��s my first time with an issue like this for a 3D printer so I��m sure the problem is rare. This thing prints perfectly and would have 5 stars if it wasn��t for the small inconvenience. I attached a few prints and upgrades I printed using the machine stock with stock profile settings. I��ll be doing a video review soon. If your budget is 200-250 this is the best 3D printer money can buy. Setup is easy, but takes 45-1hr if you are a first time printer. Tons of online reasorces that show how to set this up. I added dampeners to 2 of the motors to make it almost silent when printing. If you are looking to get your feet wet with 3D printing. Get this machine! Love this printer! Can't beat it for the price and the print quality is excellent as with all 3d printers it takes some tinkering to get it dialed in. Make sure to buy filament because the sample that comes with it is a joke. WOW!!!! This is my first 3D printer! After hours of internet searching I bought this unit. It was in my budget and the build size was great for starting out in this new hobby. Build time was about 1 hour and everything you need to asemble the unit is included. I was worried about build plate adhesion as that seems to be a comon issue in 3D printing "NOT" with this unit followed the Tempeture guide line on the filament and all three models have had great adhesion. The negatives of this printer are minor, poor placement of SD card slot, inlet to extruder is almost inline with the Z Lead Screw. These minor isues should not keep you from purchasing this printer! 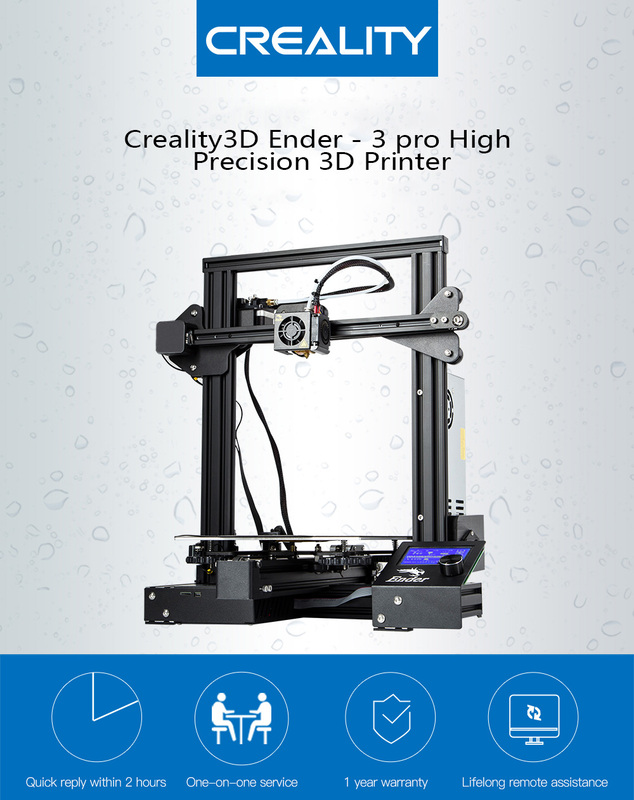 Creality Ender 3 Pro 3D Printer I would recomend this printer to anyone who wants to get started in 3D printing. Finally took the plunge into 3d printing and settled on the Creality Ender 3 as a seemingly good starting point, and I��m glad I did! This is a genuine creality product for those wondering. This is a newer/revised/updated model too. I didn��t have any alignment issues when building it like I��ve heard some of the older ones have. This one has an injection molded ABS power supply cover (older ones were 3d printed), and the bed isn��t set up in a weird trapezoid, all sides were square so it was easy to level. Again, this was my first 3d printer, so I can��t compare it to anything else, but I��m loving it so far. I did upgrade the extruder assembly to an all metal one, but that��s the only thing I��ve modified so far (though I do plan on installing some x/y dampers in the near future). Thingiverse has a lot of upgrades you can print yourself, so far I��ve printed the fan mod that directs air more directly to the hot end. For the price I have zero complaints. Assembly took under an hour. If you can put together a piece of IKEA furniture, you can assemble this printer. The instructions are simple, and if you require more help there are plenty of YouTube videos with assembly walk throughs. I��ve only printed with hatchbox PLA so far, but will try out some other materials soon (namely gizmo dorks TPU and some hatchbox ABS...after I build an enclosure). I purchased this printer a few months ago. It has been a dream to use. I would definitely recommend this as a great printer for anyone starting out with 3D printing or even for veterans that want a more compact and reliable unit. I am extremely impressed. Setup The setup was fairly straight forward. It took me about an hour to have it fully setup and powered on. All the tools needed are provided with the unit to complete the full setup. There are a few great youtube videos on setting up that you can watch as well if you need a little extra help. Use Very easy to use. This is not my first 3D printer, so I do have a little bit of experience with them in general. But this was still a very easy printer to simply start using. Leveled the bad, loaded filament and printed the test print. It came out great. My 2nd print with this machine was an Ocaraina from Legend of Zelda. It came out absolutely flawless on this Ender 3. I am very impressed. Like I said, I have had it for a few months now and it has been rock solid. I have not had a single issue. Just load filament and print. I've not even had to re-level my bed yet. Quality The unit itself is very sturdy. The hardware used is good quality. Everything aligns very well. I do not foresee any issues with quality in the future. I also have a CR-10, so I can stand behind saying that Creality's quality is top notch. Value You will not find a better printer for this price. This printer exceeded my expectations on every level. What a fantastic choice for a first 3D printer! Make sure you watch at least a few assembly videos on YouTube before beginning assembly of the printer, as this will help you avoid the common problem areas when assembling this, or any, 3D printer. My first print came out beautifully and I've had many more great prints since! A quality product all around. Well packed for shipping. Easy and well thought out assembly. I have the Pro version so it has most of the best upgrades already installed. For an open source design on an in progress technology a lot of people have done excellent work. Great performance at a great price. Takes longer to build than the 10 min it says, but overall not too long. So far this has been a fun 3D learning experience. I'm building skills as I go and have even started upgrades for the machine. There is a large community supporting this product and I enjoy reading about their successes and failures daily. Set up was fairly straight forward and setting it up to print was a breeze. Can't say I'm unhappy in any way. Great product with many extras that can be printed for it right out of the box. Thank you for providing this product! I ordered this for my wife and it arrived in a week or less from the US warehouse in California. We live in Florida. Great deal and my wife loves it. I've been using my new Ender 3 Pro and am extremely happy with it. No complaints whatsoever. It took a while for Creality to ship the unit, but once we got it and put it together, it's been working very satisfactorilly. Great design and very efficient. So far, I've had no trouble and I'm very happy with Creality. It arrived in 5 days, even though Christmas was right in the middle of the delivery window. I assembled it in about 1/2 hour. After a couple of little tweaks it has worked great. Printed a couple of upgrades and have been making items for around the house and for my grandkids ever since. The installation was easy enough. Would have been nice if you loaded a bed leveling gcode file onto the SD card as well. Makes ones life a lot easier. A good Cura slicer default file would be handy as well. By now all of this is available on Youtube, so this wasn't a big issue. The bed itself was really bad adjusted to the V-Slot. I'd be interested to know where I can find any spare part for the printer, like the V-Slot rollers or the like. All in all, I'm happy. Never had any experience with 3D printing before. I wanted to 3D print some models I'm working on to get a feel of what they would look like in real life. So I went online to check what would 3D print shops charge me to print them. Long story short, I decided that 230 bucks for a printer is probably a better investment than spending the same amount on a few 3D print orders. Before assembling the printer I watched about a dozen of 3D printing videos on Youtube - some generic tips and tricks, and some specific to the Ender 3 Pro, including a detailed assembly guide. Careful assembly took me about an hour. The guys provided all the nuts, bolts and tools required, not a single item missing. I think I spent more time leveling the print bed than assembling, because the tutorial videos stressed how important leveling is for printing. My very first print was a complete success! I scaled the model down to about 1 inch to incur least damage in case something goes wrong. I've printed 3 more models since then, the largest 6 inches long - works like a clock. Things to consider before buying: - are you comfortable with assembling the kit? Check out assembly video on Youtube and decide if this is something for you; - what are your expectations regarding quality of the prints? There is some texture on my prints, but I don't care. Verdict: strong buy if this is your first printer and you have some DIY skills.